Just occasionally my old life as a film journalist comes together with my work in history – as when, while writing Elizabeth and Leicester, I went onto the set of the second Elizabeth movie. It wasn’t the success the first had been, and the planned third film never materialised. But still, a wonderful memory! In the sixteenth century quad of St John’s college, Cambridge, director Shehkar Kapur is down on one knee, belabouring the ground with a coconut. It’s not what it looks like – a fit of frantic rage – but an invocation to Ganesh, the god of all beginnings, which he makes after the first shot of every day. Perhaps it seems an odd start to the filming of a piece of English history, but this is Elizabeth: The Golden Age, the sequel to Kapur’s first Elizabeth, and his emphasis has always been on the themes that transcend any one nation – on, as he puts it, not the history but the mythology. This is the summer of 2006 and the weather (a pattern with which we’ve since become familiar!) is changing with monsoon-speed from sun to pouring rain. The actresses playing Elizabeth’s ladies run inside to shelter, the top layers of their dresses held up with bulldog clips to show the quilted underskirt. One has her long skirt up over her head like a cape, but it’s the soldiers in their helmets who came off the best. As the sun appears again, so, in the archway to the quad, does Clive Owen – tall, swarthy, in battered ‘salt’ stained clothes. He plays Walter Raleigh, whose triangular relationship with Elizabeth – and with one of Elizabeth’s young ladies in waiting – is one strand of the story, while England’s victory over the Spanish Armada is the other. Owen and Kapur go into a huge tall-man’s hug. The scene to be shot has Elizabeth and her ladies processing into chapel, and Raleigh, fresh home from the sea, is about to make his first appearance in front of the queen. It’s the legendary moment when he flings down his cloak over a puddle at her feet and ‘he’s going to practice his cloth action’, producer Jonathan Cavendish says. As the court party reassembles under a suddenly blue sky, the queen and her ladies are all in white, huge farthingales looping drunkenly backwards and forwards as they move. The swaying hoops might well suggest a diffident Victorian modesty, but in fact the curious horizontal motion seems (at least after you’ve been struck by the size of some of the men’s codpieces) like a more languorous version of a pelvic thrust. Cate Blanchett as Elizabeth draws all eyes; regal even when she gives a ferocious sniff, or smiles at an extra and mimes a cigarette. It is at least partly those pale, otherworldy eyes that she used to such effect as the elf-queen Galadriel in The Lord of the Rings. (It was said the real Elizabeth once stopped an assassin with a look. They’ll shoot the run-up to that scene later in the day.) You can just catch her deep voice saying to the soldiers ahead of her ‘Stop’. ‘Walk on’. The very paucity of speech, the lack of ordinary chit chat, is in itself impressive. Suddenly, you understand. It’s not only Kapur’s films; film culture is itself about myth making, with stars as the royalty . . . A group of visitors ask Kapur when would be the best time to come back and watch the shooting. Rambling around the edge of the group, in baggy green and anorak, he’s the least intimidating person on set. The extraordinary thing is that he tells them, but then this scene is all about being watched; the film-making process like the real Elizabeth’s processions, and the Tudor monarch as much on show, as much the conscious star, as any modern celebrity. Away from the camera Blanchett is a deliberately down to earth presence, saying recently that star power, for her, meant being able to bring her children (Dashiell and Roman, still pre-school age) onto a set. Here indeed they are, with her husband, theatre director and playwright Andrew Upton – shooting out of a side door and declaring ‘We want fruit!’ in accents that sound less Australian than USA. But this, even more than the first, is Cate Blanchett’s movie. Early reviews are paying tribute to the fact. There could, as Kapur says, have been no sequel without her, but Blanchett had some doubts; it was only at a dinner in New York, where Geoffrey Rush – who returns as the spymaster Walsingham – added his urgings to Kapur’s that she was persuaded to agree. Nine years ago, giving interviews for Elizabeth and stressing the modernity of the role, she told me that she wasn’t playing the archetypal ‘trout in the red wig’. This time, technically, that’s exactly what she is playing. Much is made of the fact that the ordered auburn curls Elizabeth sports in public now lift off to reveal a sparse cropped head. This time around, it is another character who sports the youthful natural locks. Abbie Cornish (a third Australian) plays Bess Throckmorton, the queen’s favourite lady; but with the advent of Walter Raleigh on the court scene, a strange three way relationship ensues. At first Elizabeth uses Bess as her envoy to approach Raleigh, happy for the girl to act as her surrogate just as long as his strongest emotional bond is with the queen herself. Writer William Nicholson, following Michael Hirst (who did the original Elizabeth) onto The Golden Age, was interested above all in ‘a woman who has achieved power, and knows that any relationship – marriage, any sexual encounter – would dilute it.’ But the curious )and in Nicholson’s view, ‘very mature’ triangular relationship begins to break up when Bess becomes pregnant, and it becomes clear that Raleigh’s most powerful tie is now to the younger and more available woman. But this film takes place in the mid 1580s, and there are more than personal problems to face. The Spanish Armada is on the way. Elizabeth ended, after the 1569 revolt of the northern Catholics, with the queen deciding to abjure all private relationships (represented by Joseph Fiennes as Robert Dudley) for her monarchy’s sake. Now, here too there is a political story entwined with the personal. In Shekhar Kapur’s terms, the struggle between Elizabeth and Philip of Spain takes on a cosmic dimenasion/ He sees Elizabeth as the embodiment of tolerance, pitted against Philip’s religious fundamentalism, and this titanic battle being played out between two rulers whose aspirations are taking them beyond the realm of ordinary humanity. The film, Kapur says, represents ‘a struggle between a life of mortals – love, jealousy, marriage, children; Paradise on earth’, and the life of those, like Elizabeth, ‘so loved by God that they will not achieve harmony in mortality.’ He drew on the Buddhist ideal of formlessness, as well as the sixteenth century concepts of the chain of being, and the near-divine status that came with monarchy. let go of her mortality. Will she or will she not be able to leave mortality and aspire to divinity? The future of the globe depended on it – that’s the story. If Elizabeth had not become divine the Armada would have invaded England, and you and I would have been talking Spanish. It was very important that the tolerant divine being should win. ‘On one level it’s a very psychological film. What do you do when you think that you have gone beyond normal human emotions, and then someone walks in to remind you that you still have very hot blood running through your veins?’ When you are, as Jonathan Cavendish puts it, a woman of ‘a certain age’ who thinks she is set in one particular pattern of life until something – or someone – arrives to shake her certainty. ‘The emotional arc and the political arc are entirely enmeshed’, says Cavendish.’ By linking the two stories it becomes something of real power, I think.’ The goalposts are obviously set high here. Since the groundbreaking Elizabeth came out the way has been opened up for a whole new wave of interpretations of the Tudor age. The Tudors (made with the participation of some of the Golden Age team); The Other Boleyn Girl; besides the rival Elizabeths and several other dramas recently seen on tv. It’s probably of necessity that this is what Kapur calls ‘a more complex movie’ than it’s predecessor. A more challenging part for Blanchett – ‘much more active than reactive’ – and purposely shot with a different feel. The look of the first film aimed at for what The Golden Age production designer Guy Hendrix Dyas, calls ‘a brutal, cold quality’. This time around, instead of Durham Cathedral, York Minster and the great northern castles, they ‘took references from cathedrals with a slightly more feminine quality. The stone in the south has a warmth to it. Ely, Winchester, Wells’. It’s Kapur’s idiosyncrasy to use cathedrals to film Elizabeth’s domestic quarters. 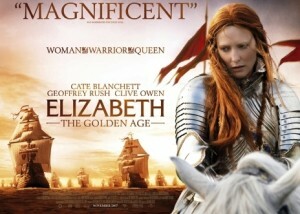 Elizabeth, Dyas says, showed the archaic, masculine world the queen inherited when she came into her kingdom. This time, it’s her world, and she has to be in harmony with her environment.’ On the set at Shepperton Studios Elizabeth’s private quarters have been created as a lush network of rooms separated from each other by a delicate tracery of supposedly ‘stone’ screens, right for what Dyas, (showing me round on another occasion), calls Kapur’s ‘voyeuristic’ way of shooting. Real stone floors have been laid down ‘to make the actors feel they’re on a film that’s moved on, that’s firmly established.’ But the faded heraldic devices on the apparently old wood panelling are effectively just transfers. It’s that amazing film magic – a combination of apparent extravagance, and make do and mend. There seem to be as many workshops in the modern studio world as there would have been departments in Elizabeth’s own palace court. In the sixteenth century you would have found bakehouse and brewery, stables and guards. Today, you pass plastic models and carpentry, armour and wigs. On one Shepperton stage is the vast green and white tent where Elizabeth is to spend the night of the Armada, topped by heraldic beasts and its fabric printed with Elizabethan designs. Dyas points with pride to the figures carved on the tent poles. Gold leaf has been slipped in behind them, in the most painstaking attention to detail. In the paint department they are creating the queen’s bed, a fantasia in gilded fibreglass, while rows of moulded Tudor roses lie like cookies on a baker’s tray. Beside them, ridges are being carefully crafted onto fibre glass model heads. These are to decorate the ships in the Armada scene, and they need to look as if long years of ropes have worn the paint away. In the film, Raleigh’s own Tyger is used as a fire ship, while he makes a daring underwater escape. (‘Playing Errol Flynn’, says William Nicholson, whose original vision had been of the English launching an unsuccessful assault on the Spanish ships, and then of Elizabeth rallying her herself almost to summon up of her own power the famous storm.) History tells that the real Raleigh played a comparatively minor and ultimately land-based role in the Armada story; while it was the ageing Dudley who was by Elizabeth’s side at Tilbury. But then, Elizabeth’s legendary speech at Tilbury has, for the film, been transposed from the flat muddy Thames estuary to the more dramatic cliffs of Brean Down in the West Country. And the costumes which had so far (says costumer Alexandra Byrne) taken references from Balenciaga, suddenly look more like Joan of Arc as Elizabeth addresses her troop in full shining armour. ‘I do not work from “the record”. Ever’, says William Nicholson, who has the C.S. Lewis drama Shadowlands and a co-writing credit on Gladiator behind him. ‘It doesn’t work. Drama is about creating feelings. It’s a different thing from real life.’ And here, his colleagues agree that the Indian Kapur may feel less constrained than an English director would be. ‘Because we’re not living within British culture, maybe what Shekhar and I had was a sense of objectivity’, Blanchett said of the first movie. Back in Cambridge that wet summer day, as the queen and her court processed again, (and as a terrifyingly realistic rubber ‘baby’ appeared suddenly from a crate, to be held up for the queen to bless), there was a chance to ask Kapur whether it’ s true he plans another film, covering the last years of Elizabeth’s long life? ‘Yes, yes, yes. Whenever Cate says yes.’ It surely can’t be soon – the challenge for the 38 year old Blanchett of playing an old woman, while carrying the emotional weight of an entire film, would be extraordinary. But the theme is clear in his mind. ‘The first film was the journey from innocence to ruthlessness’, Kapur says. ‘What is lost in the quest for power. The second one is about divinity and immortality – where people in absolute power start to aspire to the divine and the immortal. Elizabeth, Philip, bin Laden . . . The third one is about mortality – what happens when those who aspire to, and become, immortal have to face their own death. It’s about Elizabeth saying, I have been divine, yet I am not so loved by God that I will be immortal’. But the film-makers haven’t yet found the story which would wrap up the ‘trilogy of power’. No wonder Jonathan Cavendish sounded a note of caution. ‘The great thing about making films is that with all the years of planning, the alchemical process, you don’t quite know what you’re going to get in the end.’ With The Golden Age still in the crucible, it is too early to say what ‘the final chapter in the tale’ can be.